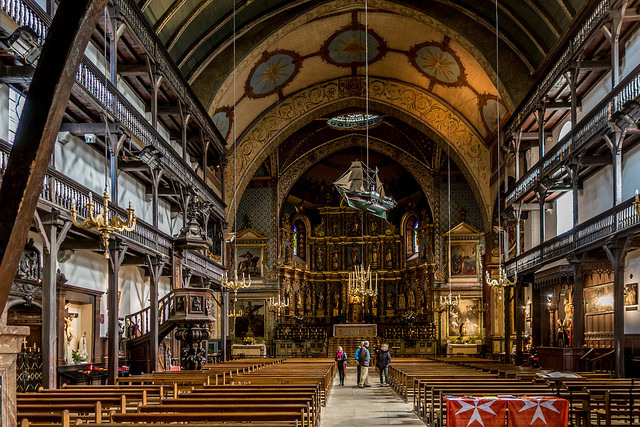 Église Saint-Jean-Baptiste de Saint-Jean-de-Luz, photo by the author. Prompted by a sketch on CBC radio, I was curious this morning to see how Google would answer the question, "Does God exist?" To my mild surprise, the first page of results consisted of statements that God does, in fact, exist. I don't know whether or not God exists. But I have no good reason to believe that God exists. No evidence to suggest existence. No reason not to disbelieve. And that's why I was surprised to see a page of Google results all arguing in favour of existence. Now let me be clear. If you wish to believe in God that's your right, and I respect that decision. Belief in God is not a simple matter, and involves much more than simple arguments and evidence. I respect that. And rest assured that whatever my own beliefs, I take your faith seriously, and I celebrate that fact about you. The list of articles on Google's front page, however, are a different matter. They are addressed to people who don't know the answer to the question of whether God exists, and they offer reasons to believe. It would be nice if Google offered a more balanced view. And that's the purpose of this post. Basically, the plan is this: I'm going to look at the reasons these articles give us to believe in God, and explain why they are not actually good reasons. The first article offers us "six straightforward reasons to believe that God is really there." This first argument points to the fact that the Earth is perfectly suited to life, and to the complexity of life on earth, and suggests that the only explanation for this is that God exists, created life on Earth, and continues to sustain it. The author also argues that "evolution alone does not fully explain the initial source of the eye or the brain." This is known as the teleological argument for God's existence and has been around - and refuted - for several centuries. To understand why this isn't a good argument for the existence of God, let's suppose that all of our other answers actually do fall short. We don't know why the Earth is perfect. We can't explain exactly the human eye or brain came into existence. It doesn't matter. There might not be any explanation. If you have an infinite number of monkeys typing on an infinite number of typewriters, one of them will eventually create the complete works of Shakespeare. If you have an infinite number of planets, one of them will produce perfect conditions for life. What if they couldn't? Well, then we wouldn't exist. We presume that there must be an explanation, and that this explanation can be knowable by humans. That's a lot to presume. Too much, I think, to provide good reason to believe that God exists. This is known as the cosmological argument for the existence of God, and has been around even longer than the first. It is especially popular these days because of the existence of the big bang theory of the universe - the idea that at a point some billions of years in the past, the universe came into existence with a big bang, and has been expanding ever since. So the cosmological argument is essentially this: "The universe has not always existed. It had a start...what caused that?" I'm pretty sure I don't know what caused the big bang. I'm pretty sure you don't either. In fact, I'm not sure there was a cause at all! When we say that "everything has a cause" - how do we know? Indeed, the concept of causation is itself a very weak foundation on which to build an argument. It might be that there are no causes at all. The concept of causation might be something we invented as humans in order to make sense of the world. You can explore this argument in the writings of David Hume. This is sometimes known as the natural law argument and is similar to the argument we just considered. And yes, scientists have expressed amazement that the world appears to follow natural laws. As argument above, there might not be any reason why there are natural laws. Or even if there are reasons, we might not have discovered them yet. Equally likely, though, is the proposal that there might not be any natural laws, at least, not in the sense that this argument describes them. The argument is this: the laws might not exist in nature. They might only exist in our minds. When we look at random things, we see patterns in them. This is something we do all the time. When we look at clouds, we see animals. Human brains are essentially pattern-recognition devices. So it's no surprise that we recognize patterns. When it comes to natural laws, though, we take the concept a step further. We think of these laws as an explanation for the natural world. We talk as though natural laws control phenomena in the world. That they have independent - and infinite - existence. But we have no reason to believe any of this is true. But suppose all of this was true. We still don't have any reason to believe that, because of this, God exists. There might be no reason why natural laws exist, or the explanation for them might be beyond us. This is a variation on the teleological argument. It is essentially this: "DNA is a three-billion-lettered program telling the cell to act in a certain way. It is a full instruction manual... You cannot find instruction, precise information like this, without someone intentionally constructing it." The problem with this argument is that I could use the exact same evidence to argue for the opposite conclusion. I could argue that "DNA is precise information that programs the creation of a human being, and it was not designed, therefore, you can find precise information like this without someone intentionally constructing it." When they say "you can find precise information like this without someone intentionally constructing it" I just say "why not?" And it is here that the argument cannot be made. It's like, if we look at something really complicated, like a human being, you cannot be surprised to find it created and run by something really complicated, like DNA. I look at this and way, "well, what did you expect to find?" Humans are complex. We all knew that. But it doesn't follow that God exists. This argument is sometimes called the trademark argument, and can be found in the writings of Rene Descartes. "The mere fact that I exist and have within me an idea of a most perfect being, that is, God, provides a very clear proof that God indeed exists." As I said above, this morning I typed "Does God exist" into Google. By the time I sat down to read this article, an email advertisement called 'Sync with God' had appeared in my email. But that wasn't God pursuing me. It was a direct marketing company called Vertical Response. The author of this article writes, "I didn't realize that the reason the topic of God weighed so heavily on my mind, was because God was pressing the issue." But of course there could have been may other reasons why the topic of God was on their mind. Indeed, I think of many things that don't exist. For example, I have frequently thought about my Nobel Price. I wonder how the present King of France gets along with the Queen. I often think about the way I can fly though the air unaided. The argument here is that though Jesus God actually presented himself to the world. "Look throughout the major world religions and you'll find that Buddha, Muhammad, Confucius and Moses all identified themselves as teachers or prophets. None of them ever claimed to be equal to God. Surprisingly, Jesus did." It should go without saying that the mere fact that someone says they are God does not prove the existence of God. We would need additional evidence to show that they actually are God. We are told two things: first, that he said that he was God, and second, that the miracles prove that he is God. There isn't sufficient evidence to believe that either statement is true. The best evidence for the first statement is the evidence of what he said in the Bible, and yet even in the Bible he doesn't actually come out and say that he is God, but rather uses vague metaphors like "I am the light of the world" and "I am the way, the truth, and the life, no one comes to the Father but through me." But even if he said it, do the miracles prove it? For the sake of argument, let's suppose that the miracles actually happened as described in the Bible - that he cured the sick, raised the dead, fed the hungry, walked on water, etc. Do these things prove that he is God? Numerous alternative arguments suggest themselves (and have been thoroughly explored in science fiction). Maybe he was an alien. Maybe he was an illusionist. Maybe he was a skilled doctor. Maybe he was a magician, either a real one like Merlin or the djinn, or a fake one like Harry Houdini. The second set of results from the Google search reference the work of the respected philosopher Alvin Plantinga and offers eight reasons to believe God exists. Plantinga is required reading for those who study modal logic (that is, the logic of necessity and possibility). Most of the arguments have nothing to do with Plantinga, so we'll look at them first. The first four arguments offered in this article overlap with the articles we just discussed above, and I won't restate them. Suffice it to say that they are all of the form "God is the best explanation for x" where 'x' is existence, or causation, or design, etc. This type of inference - 'inference to the best explanation' - is known more formally as abduction and originates with Charles Sanders Pierce (though the form has been around a lot longer). It's the sort of reasoning employed by Sherlock Holmes. Given these principles, God is very rarely the best explanation. When we build a bridge, we do not depend on faith, we depend on the principles of engineering. When we cure the sick, we do not rely on prayers, but on modern medicine. The result is what is sometimes called 'God of the Gaps' whereby God is used to explain a smaller and smaller set of unexplained phenomena. At a certain point, we may run out of gaps; either we'll know the explanation, or we'll know why it's unexplainable. Now I'm going to pick up the numbering from the second article. The problem of consciousness is what philosopher David Chalmers calls the hard problem. This this problem isn't just about the problem of consciousness itself (which I argue elsewhere is nothing more than experience itself) but about intentionality. "Intentionality is the property of being about something or of something. It signifies the object-directedness of our thoughts." How can we mean anything? A lot has been written over the years about intentionality, ranging from Edmund Husserl's description of phenomenology to Jerry Fodor's account of representation. We can get a sense of how difficult this problem is by reading Saul Kripke on naming and necessity. According to this argument, no physical object has intentionality, while intentional states fit comfortably into a theistic worldview, and so, God is the best explanation for intentionality. The core problem (to my mind) of intentionality is that for one thing to stand for another, there must be a third thing - a perceiver - that recognizes it as such. So if an experience - a sensation or whatever - stands for an object or state of affairs in the world, there must be a third thing - a mind - that makes this connection. And this is what fits comfortably into a theistic worldview. However, none of this proves that God exists. Perhaps the concept of God explains intentionality, but it is unlikely to be the best explanation. Our experience of, and understanding of, intentionality is the same whether or not we believe that God exists in order to explain it. For my own part, my own theory of mind is a non-representational theory of mind. That is, I don't think that our conscious thoughts actually stand for anything. They just are what they are. The article suggests, "for atheists, there really are no intentional states." Quite so. It is very possible that we are fooled into believing we have intentional states or that we falsely believe there are intentional states. Again we have an argument of the form "God is the best explanation for..." and so I would apply all the arguments from above to this argument here. That said, this is known as the argument from morality and is a very common argument for the existence of God and is statement in its most famous recent formulation by C.S. Lewis (yes, the same person who wrote Chronicles of Narnia). The form of the argument is this: first, there is a universal objective moral law that applies to all. But if God did not exist, objective moral values and duties would not exist. Therefore, God exists. We can read a lot or argumentation trying to show that there is, indeed, one universal moral law; it's the type of argument that appears on a regular basis in newspapers, magazines and even academic journals. Just the other day I read an article about Oxford philosopher Oliver Scott Curry's research suggesting there are seven underlying moral principles in all societies. Are there objective moral values common to all societies? I have my doubts. Even Curry admits that these seven principles are prioritized in different ways by different societies. Some societies value loyalty over honesty, while others value the reverse. Even with only seven moral values there are 127 possible moral codes that result. Others say that there is a single moral code common to all, that we should treat others as we, ourselves, would wish to be treated. Perhaps - though in a world of narcissists, masochists, exhibitionists and more, I'm not sure such a rule could be coherently formulated, let alone applied. In fact, we all want to be treated very differently, which makes the golden rule fundamentally incoherent. That said, let's suppose that there is such a moral code, whatever it is. Does it follow that God exists? No, it does not. Numerous other alternative explanations exist, ranging from the suggestion that we just invent moral principles (J.L. Mackie) to the idea that we have a social need for them (Kai Nielsen) to the idea that we have a moral 'sentiment' in the same way we have a sense of balance or a sense of pleasure and pain (David Hume). For myself, I believe that I am a moral person, but I believe that my own morality is based partially on my own sense of compassion and empathy, and my own choice to live in a world where these matter. This is Plantinga's argument, and is a variation on the ontological argument for the existence of God, originally formulated by Thomas Anselm. Anselm's argument is this: In our mind, we can imagine the greatest being. It could just exist in our mind. But existing in the world is greater than existing in the mid alone. So, we cannot imagine the greatest being without the greatest being actually existing. This is similar to a set of arguments questioning whether we can grasp certain concepts in the mind without outside help. Take the concept of infinity, for example. We all have an idea of infinity (just start counting, and keep going...) but could we have that idea without infinity actually existing? The difficulty with this sort of argument is that there seems to be no limit to what we can imagine. It seems to be very easy to imagine things that don't exist. The fact that something is possible doesn't make it true. This is where Plantinga comes in. His arguments are based in modal semantics. The idea is, if there is a statement that is 'possibly true', then there is a 'possible world' in which the statement is true. Meanwhile, a statement is 'necessarily true' if it is true in every possible world. So Plantinga's argument is that if it is possible that a statement is necessarily true (that is, it is true in one possible world) then it is true in all possible worlds. In other words, any possible necessary truth is necessarily true. God's existence, it is argued, is a possible necessary truth. Therefore, God's existence is necessarily true. We need to be careful here (in a way this argument is not careful). The question is not "is it possible that God exists?" The question is "is it possible that it is necessarily true that God exists?" That's where we are being misled by this article: "So the question is, is God’s existence possible? Well, what do you think? The atheist has to maintain that it’s impossible that God exists. That is, he has to maintain that the concept of God is logically incoherent, like the concept of a married bachelor or a round square." No. It's the other way around: is denying the existence of God like saying that there are unmarried bachelors or round squares. Is denying the existence of God possible? I think it is, and I think the proof of this lies in the question itself. We don't need to argue that there are no unmarried bachelors, or that there are no round squares. But we do need to argue (evidently) for the existence of God. Therefore, denying the existence of God is indeed possible. Indeed, there are atheists who take this argument a step further, and argue that it is not possible that God exists! We are told "The idea of a being who is all-powerful, all-knowing, and all-good in every possible world seems perfectly coherent," but to many people, it does not seem coherent at all. Could God make a stone so heavy he could not lift it? Could God do something that is not good? This is known as the omnipotence paradox. These questions linger, and seem to speak not for the possibility of the existence of God, but against it. This is known as the argument from religious experience, and it is discussed in numerous works over the years, the best known of which is probably William James's The Varieties of Religious Experience. I don't doubt that people have religious experiences. I've personally known people who have had them - one person I knew saw God in the second level commissary, and another saw his own angel in the window. I don't doubt either experience, and more, there's no doubt that they were transformative and in at least one case led to a deep religious faith. But, you know, just because we think we saw something doesn't mean we saw it, at least, not in the sense that it is sufficient evidence for other people to believe you saw it. Indeed, the problem with religious experiences is that they're just the sort of thing that can't be used as evidence. They're transient. They're personal. They require interpretation. What makes me take religious experience seriously is the impact they have on people. They may not prove that God exists, but they have a characteristic impact on people. They are what Rudolf Otto called 'mysterium tremendum et fascinans' - as mystery that is at once awe-inspiring or even fearful, and which is fascinating and draws us toward it. But again, such experiences are not a proof of the existence of God. As Scrooge says, it "may be an undigested bit of beef, a blot of mustard, a crumb of cheese, a fragment of underdone potato." On yet another one of Google's first page results there's another set of arguments that need to be considered. This is a commonly heard argument. "If God does not exist, life is ultimately meaningless. If your life is doomed to end in death, then ultimately it does not matter how you live. In the end it makes no ultimate difference whether you existed or not." The problem with this argument is that there might not be a reason why we exist. The embrace of this (unpleasant) conclusion is called existentialism, and it is essentially the philosophy that there is no reason for existence. We just exist; that's all there is to it. As Wikipedia says, "While the predominant value of existentialist thought is commonly acknowledged to be freedom, its primary virtue is authenticity. In the view of the existentialist, the individual's starting point is characterized by what has been called 'the existential attitude', or a sense of disorientation, confusion, or dread in the face of an apparently meaningless or absurd world." It is worth noting that this freedom ultimately makes religion a choice, and that you can gradually come to believe that something is true by making the decision to believe that it is true. Søren Kierkegaard called this the 'qualitative leap', or as we know it today, the 'leap of faith'. For my own part, I have said in the past that I think that the reason we are alive is because it's possible, and the reason we die is to continue to allow it to be possible, by allowing our form of existence to grow and develop and adapt and flourish. The argument here is that "If there is no God, then there is ultimately no hope for deliverance from the shortcomings of our finite existence." For example, "there is no hope for deliverance from evil... we are locked without hope in a world filled with gratuitous and unredeemed suffering (and) there is no hope of deliverance from aging, disease, and death." The appeal here is partially to the idea of an ideal life after death, in heaven, and partially to the ideal of a heaven on earth. The argument is that, without God, these ideals are unreachable. The first response is that it may just be that these ideals are unreachable. We may dislike the idea that there may be no life after death (I know that I do) for example, but our dislike for something doesn't make the opposite possible. There may actually be no hope. Indeed, religion may just be one manifestation of the denial of death, the denial of our inevitable fate, as the only way to make day-to-day life bearable. The second response is to make the point that the only real hope for any of these things is the hope we create for ourselves. As the saying goes, God helps those who help themselves. To the extent that we have been able to reduce evil and suffering on earth, and even to make modest advances against death, I credit not the existence of God, but the work of dedicated and selfless doctors, scientists and public servants (including, I hope, myself) through history. This argument speaks to the heart of human longing and desire. "Think of it! That the infinite God should love you and want to be your personal friend! This would be the highest status a human being could enjoy!" It would indeed, but again, it may be the sort of thing that's unattainable. We can imagine love and friendship, even if we don't have these in our own lives, and for those without that, religion has an undoubted appeal. But as even the arguer admits, "none of this shows that God exists." The suggestion is that "it makes a tremendous difference whether God exists." But that's not what makes the difference. What makes the difference is whether you believe that God exists. If you can believe it, and if you can believe God loves you, it helps you manage even if you are otherwise friendless and unloved. I'm not going to argue against that. Indeed, it points to some of the good that religion can do. But I want to be equally clear about the risk here that people purporting to be religious use the need for love and friendship to prey on those in need. There can be false Gods and false prophets., There can be people who falsely proclaim that you are loved and needed while at the same time manipulating that love and need to their own ends, to the detriment of both the genuinely religious and to society at large. The article continues with some additional arguments - the cosmological argument, the teleological argument, the argument from morals, which I'll skip because I've covered them above (though I do like the duiscussion of J.L. Mackie and Michael Ruse in this particular article). This was essentially the creed I repeated when in church as a child. It is known as the Christological argument. Essentially the argument is that Jesus was executed, buried, and resurrected from the dead, and the only way this could have happened is if God existed to make it happen. It is difficult to know precisely what happened roughly 2,000 years ago, but even if we accept the minimal facts version offered by Gary Habermas, it would be a remarkable occurrence. The first question to is is whether it actually happened. There are many other explanations that have been offered over the years to the effect that (say) people were told Jesus was executed, but it didn't happen, or, that a body double was used, or that Jesus was taken down before he actually died, etc. I am not in a position to judge whether any of these is true. But it is noteworthy that it is not unambiguously true - after all, if I had come back from the dead to prove my divinity, I would have paraded my living flesh up and down the main road in Jerusalem and dared the Romans to do it again. But there are many ways all of these events could have taken place. A second question to ask is whether Jesus could, in fact, have come back from the dead. It had already happened before, according to Biblical accounts, in the raising of the son of the widow of Nain. In fact, the Bible records that Jesus raised three people from the dead: Jairus daughter (Mark 5:22-43);the widow's son (Luke 7:11-15), and his friend Lazarus (John 11:1-44). It may be, as some argue, that being 'raised from the dead' was quite common in Biblical times. So let's assume Jesus was raised from the dead. Does this prove that God exists? Again, it comes back to the question of whether the existence of God is the best explanation for the resurrection of Jesus. And, arguably, it does not pass the test. The very fact that resurrection was so common speaks against it being extraordinary, which in turn speaks against it being the exceptional sort of event that could only be explained by God's existence. In fact, there have been numerous cases of people being 'risen from the dead' in post-Biblical times. In some of these cases, a religious explanation is offered. But many others are explained more scientifically, sometimes as cases of what has come to be known as the Lazarus phenomenon. In short, if you don't already believe in God, you aren't likely to believe in the resurrection. Even if you do believe in God, you might not believe the resurrection. And you can believe in the resurrection even if you don't believe in God. I don't have much more to say about the question of whether God exists than this. Google's front page may offer a bunch of arguments for God's existence, but they are, on the whole, not very good arguments. We wouldn't accept them in other aspects of our life. The arguments for the existence of God (like the arguments for so many things) are based in general on some sort of understanding that we think we have of the world - that complex things must be designed, that there must be a cause for everything, that the laws of nature are universal truths, that what we see or feel exists, that we can know that some things must be true, and so on. But we are learning today that many of these truisms aren't true. We know that time moves backwards, that complex things organize themselves, that objective reality is an illusion - we know that the world, far from being understood, is far stranger than we can imagine. That we can claim to have proven the existence of God in a world where we can't even prove the existence of the cup on my desk in front of me seems to be unreasonable. And so I conclude that we haven't proven that God exists, nor that there is any prospect of our doing so without a substantial revision to our understanding of the world. I know that these arguments have focused on a Christian God. This is because the Christian God is the focus of most of the arguments I have seen offering proofs for the existence of God. I know there are many religions and many conceptions of God. My objective here was not, and is not, to argue that any one or another of them is true or not true. I am specifically and only interested in the question of whether these arguments are successful in their stated intent of proving the existence of God. And let me reiterate from above that I take religion very seriously. I take your religion very seriously, and I celebrate and honour your faith. My academic studies in philosophy were supplemented with numerous courses in religious studies (enough to have constituted a minor has I declared it). I have read your religious texts and visited your places of worship. I will probably wrestle with these questions as long as I live, and I am happy for those who have found comfort and peace in their own faith.